Welcome back to the sneak peeks of Clearly Besotted's January release! If you've only just joined in the fun, then be sure to check out Day 1 and Day 2 (especially if you're a fan of punny cards!) All of the new goodies will be available to purchase from tomorrow night at 10pm GMT. 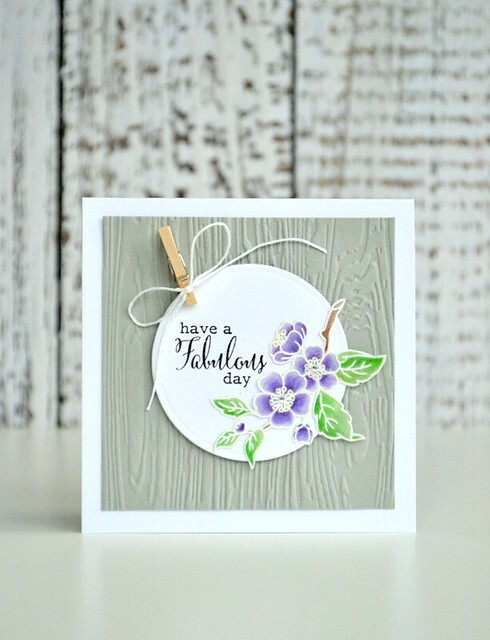 You may, or may not, be glad to hear that I've stepped away from the punny cards for today with this card featuring stamps from the Minature Florals Collection II set. I wasn't kidding when I said that there was something for everyone with this release! Clearly Besotted design stunning floral-themed stamp sets like no-one else IMHO. This set works fabulous on its own or paired with the larger versions of the flowers you'll spot from previous Clearly Besotted sets. I'm thinking of beautiful cards co-ordinating with miniature versions as tags for a future project! I'm not brilliant when it comes to horticulture so I'm not entirely sure what colour these flowers should be. I'm a true believer in artistic license with such things so go for whatever colour you please! I heat-embossed the flowers onto vellum and coloured the majority on the reverse (no need to stay inside the lines!) using cheap anything-but-fancy pencil crayons. I then added a touch of shading and sparkle on the front using Sakura Gelly Roll Stardust pens. There's some serious fussy-cutting going on with these vellum flowers, but following a raised, heat-embossed line makes it much easier than you think. From punny stamp sets to seriously stunning floral stamp sets, there's a lot to check out in this release! I won't keep you any longer as I just know that Stephanie will be sharing plenty more sneak peeks with links to the rest of the talented Design Team's wonderful creations. Enjoy! CBS flowers are astonishing. And, your cards are always a spectacular display of their beauty, Amy. Giving a try to some of these "regular over-the-counter" supplies, including a set of inexpensive school color pencils. Always thinking on crafting items that can be taken on road trips without the pressure of loosing valuable supplies. Cheers! I love the color of the flowers! Wow! I was surprised to read you colored the flowers with crayon pencils--love it! Thanks for showing that we do not have to have the expensive things! Beautiful card! Just a quick message of gratitude from Stephanie Wincott for showcasing her new stamp releases. I would also like to thank you and I love your cards. Lovely card with beautiful coloring! Love the look of the flowers on vellum, nice card design! I think your 'artistic license' purple blooms are gorgeous and how wonderful to learn you used pencil crayons! Fabulous showcase..
A really super set of cards for the clearly besotted release hugs Bee. shelter or law enforcement assist. This website is for Info ONLY. Love this card. Thanks for sharing your tips!